In November, I was exploring Union Square Park with a teacher from Stuart Hill Elementary and several members of the Union Square Conservancy. The park is a wonderful spot of green surrounded by asphalt and concrete. There are a good variety of mature trees with a few young ones planted along the streets. As we walked, talked and identified the tree species growing there, we also noticed the telling rows of holes made in several trees by the Yellow-bellied Sapsucker (not a joke but a real bird). "Sapsucker holes," I said, "Woodpeckers around here?" "Oh yes. In the winter we hear their tap-tap-tapping," someone replied. 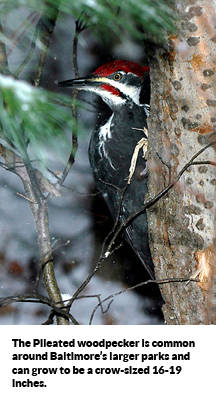 The Yellow-bellied Sapsucker, actually a woodpecker, lives in Maryland year-round. In Baltimore, I primarily see them during the winter. That’s not unusual for our city. We have lots of woodpeckers. Birds still follow the migration routes ingrained in them for thousands of years. The eastern flyway traverses a highly human-populated and developed landscape. When crossing this sea of asphalt and concrete of cities, these small parks like Union Square become welcomed rest stations for tired migrants and those seeking a winter home. There are several kinds of woodpeckers in Baltimore. The Downy woodpecker looks like a smaller version of the Hairy woodpecker. Both have a black-and-white "ladder" pattern on their backs. The males have a patch of red on the head, the females do not. The Red-bellied woodpecker has red on its head with only a light blush of red on its belly during the summer breeding season. The Yellow-shafted Flicker, also a woodpecker, shows bright yellow on the undersides of its wings when it flies. It also is often seen on the ground hunting ants. Our largest woodpecker, the Pileated, lives in large acreages of woodland such as Leakin Park, Druid Hill Park and Cylburn Arboretum. I'm told they will come to a suet feeder but I've never had such luck. Actually watching woodpeckers is more fun than just hearing them. Any size of backyard, especially those with trees or trees nearby, can attract woodpeckers for easy, upclose viewing. Woodpeckers do not usually come to bird feeders containing seed. They prefer a fat- and protein-based food like the suet cakes sold at hardware, big box and some specialty wildlife stores. I prefer making my own concoction to smear on a tree trunk in my yard or fill the holes of a “suet log” (a piece of wood with 1-inch wide by 1-inch deep holes randomly drilled and hung with an eye screw in the top. Enough crumbs to make the mixture stiff. I save crumbs from the bottom of cereal boxes, old crackers, stale bread, old cake, etc. and run through the food processor to make finer crumbs. Store in the refrigerator; fill the suet log as needed. The birds will probably take anywhere from a few days to a couple weeks to find your offerings, but once they do, you will be rewarded with lots of activity. Birds other than woodpeckers will also enjoy your offerings. Tufted titmice, Carolina chickadees and white-breasted nuthatches all come to suet feeders. Sometimes other birds do, also. Wintertime is a great time to watch and learn about our feathered neighbors. Glenda Weber is the naturalist for Baltimore City Recreation and Parks. She leads the nature programs conducted at Cylburn Arboretum and Howard Peters Rawlings Conservatory and Botanical Gardens. She can reached at [email protected].